Dieses Haus befindet sich in einer Gated, familienorientierte Resort direkt am Meer mit 24 Stunden Sicherheit befindet. Diese wundervolle Lage hat zwei Pools (innen und olympischer Größe Außenseite) plus zwei Kiddie-Pools, drei Spielplätze, Snack-Bars, Lebensmittelgeschäft, Bingo und andere geplante Aktivitäten für die ganze Familie im Erholungszentrum. Nur wenige Minuten entfernt sind die Hauptattraktionen wie Broadway at the Beach, das Hard Rock Cafe, Planet Hollywood, NASCAR Cafe, Ripleys Aquarium, IMAX Theater und Palace Theater mit Top-Entertainer umfasst. Auch Outlet Malls, Flohmärkte, Gastronomie, Country-Musik-Theater, Dixie Stampede und der Las Vegas basierte Legends Theater und über 100 Weltklasse-Golfplätzen. Unser Strandhaus liegt in der Nähe des Pools und Erholungszentrum. The house has a great view of the ocean. Everything was as advertised about the house, the only downfall was the WiFi was not very fast. We're glad you enjoyed your stay and would happily have you stay with us in the future. The house was amazing, and the view was awesome. Great location. Just wished we could have stayed. We had to leave because of Florence. We were not even there 24 hrs and had to leave. This was a super location and everyone really enjoyed their stay. The house was great! Ocean Lakes has lots of things to do for the entire family. Can't say enough about the Ocean Lakes staff and how friendly everyone was. Excellent Beach View, with great beach access and playground. We had a fun visit! We just returned from our first visit to Ocean Lakes. Sandy Beach Rentals was a true pleasure to work with....they made everything so easy and were excellent in communications. The Ocean Lakes community is huge and they offer tons of things to do. The pool is beautiful and the adjacent game room was so much fun. There's just so much to do at Ocean Lakes, there's little reason to even leave the community. Our unit was #905 and it is a pet friendly property with endless ocean views... which were spectacular! You could literally see the ocean from nearly every window in this home. The decks are huge and the furnishings inside the home are very well cared for. The living room has even been upgraded with a large television and really lovely furnishings. The kitchen was well stocked with dishes, cookware etc. The bathrooms were spacious and very clean. We loved the ease of having a tile floor in the downstairs areas. The house is located on what they call the "Swash" so it's like an enclosed ocean run off area. It's a lot of fun to watch folks fish a bit in there and we loved watching a beautiful Mallard land at the "Swash" area almost daily. The ocean is about 4 houses up from #905 and it is very easy to access. 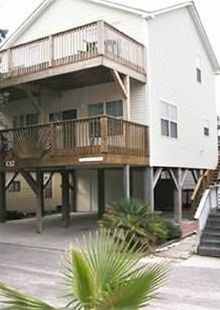 Thank you Sandy Beach Rentals and Ocean Lakes for providing a beautiful vacation spot for us in Myrtle Beach! Wir haben über 100 Golfplätze im Grand-Strand-Bereich. "Der Eigentümer dieser Website ist nicht mit dem Ocean Lakes Familiencampground, L. P., (dem Betreiber des Ocean Lakes Familiencampgrounds), den Ocean Lakes Properties, den Jackson Companies oder einer ihrer Tochtergesellschaften verbunden oder gesponsert." ALL SEASONAL RATES ARE "FROM" THE PRICE LISTED. Pricing may change during that seasonal period. There is no way to include that option on VRBO. Ex: During the late summer rate, it is listed as $2500/week. Our summer rate ranges from $3550 the first week of August to only $1550 the week of Sept. 17-24. PLEASE CALL FOR CONFIRMED PRICING. Linens are included during peak season.